Lyndsey McCay wins Ulster Herald award for December after Omagh Ladies Senior One Cup success. WHEN the McCay clan got together over the Christmas and New Year period they had no shortage of 2018 highlights to reflect on. Of all families they certainly won’t forget the Ireland ladies hockey team’s astonishing achievement in reaching the World Cup Final in London back in August. At Lee Valley Olympic Hockey Centre, seasoned international Shirley McCay played a lead role as Ireland, against all the odds, recorded memorable victories over USA, India twice and Spain before being defeated in the showpiece final by the classy Dutch. Graham Shaw’s national team reaching the World Cup Final was beyond anyone’s wildest dreams and in years to come that achievement will no doubt rank as one of the greatest ever in the history of Irish sport. It was particularly special for the McCay family, who were there in the flesh to cheer on Shirley – the most capped female Irish athete with 273 caps -and her team-mates in becoming national legends in their own right. And it would appear the success of the Irish has rubbed off locally. Since those glorious hot summer days in Lee Valley, Omagh Hockey Club has continued to flourish and by the end of the year both the club’s firsts and seconds were sitting proudly on top of Senior League One and Junior League Two respectively. Both are well placed to go on and secure promotion and they certainly won’t be lacking confidence after Lyndsey McCay, Shirley’s younger sister, captained the club’s first XI to an historic first Senior One League Cup triumph at Stormont on the final Saturday of the year. to lift the prestigious silverware following a richly deserved 2-0 victory against Raphoe, that after Omagh had impressively topped their qualifying group and defeated Portadown 4-0 in the semi-final. Lyndsey’s all-encompassing role has been key to Omagh’s achievements. Not only has she been a kingpin at the heart of the Ladies defence, not only has she inspired those around her, especially the younger players, to greater things but she has also been taking on many of the training pitch duties this season after the local side failed to secure the services of a recognised coach. Her role can’t be underestimated, least of all by those within the club, and that makes her a richly deserving recipient of the UH Sports Personality Award for the month of December. Reflecting on the past six months or so, Lyndsey admitted that the feel-good factor following the achievements of her sister and Ireland combined with a team that has matured and grown together over the past couple of seasons had proved a recipe for success. “The Senior Cup win was a definite highlight to end the year on and a great confidence boost midway through the season,” she said. “Hopefully we can use that for the League and the upcoming Irish Trophy match. “We got promoted to Senior One two years ago and last season we built on that. We have had the same team now for a couple of years and we have gelled together as a unit. Hopefully that continues. “During the World Cup the girls got together to watch the Ireland matches, there was a bit of team bonding going on and that has continued with different nights out and, of course, the gala in November. This weekend Omagh will be hoping to continue their winning start to the new year when they visit North Down and the following weekend Lyndsey and her team-mates entertain Greenfield in the quarter-final of the Irish Trophy. The Ladies began 2019 with a narrow 1-0 win at Armagh before defeating KV Ladies, one of their chief rivals, 4-1 in their own backyard last weekend. 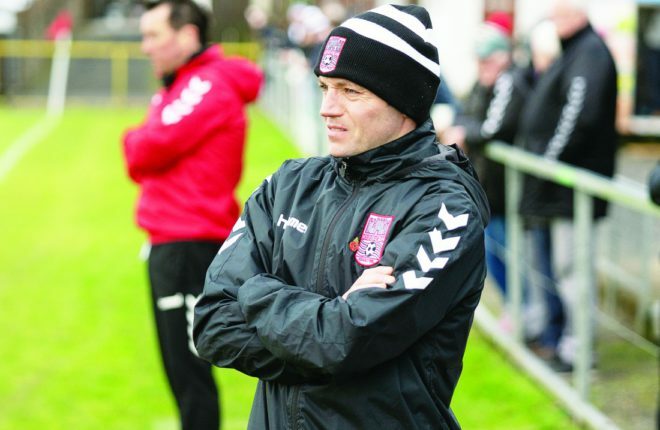 Another league victory against North Down on Saturday would further boost the confidence ahead of that crucial last-eight clash against Greenfield, who Omagh won’t need reminding defeated them 1-0 in the 2012 final. Lyndsey though is looking no further than the trip to North Down. “The first match of the year didn’t maybe go totally to plan but last Saturday we produced a great performance in defeating KV Ladies 4-1,” she added. “That was a big game, in recent times KV have presented us with our toughest challenge so we were thrilled with that result.